Why concrete structures fail? 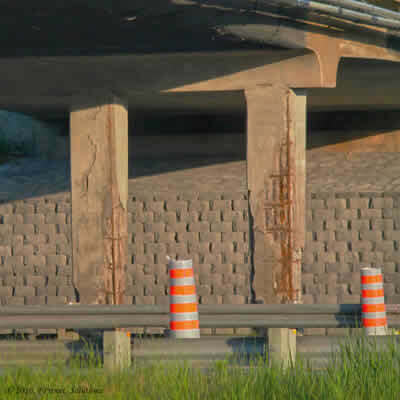 Concrete has long been known as a reliable construction material, but deficiencies in material selection, detailing, and design can affect the service life of Concrete. 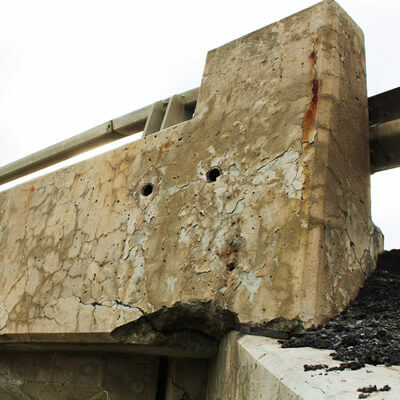 Deterioration of concrete structures can become a challenge for the owners of these structures. It is important to identify these defects on time, and plan appropriate repair strategies. In this article, we will review some of the most famous deterioration mechanisms. In doing so, we have focused on the Ontario Structure Inspection Manual (OSIM, 2008). In addition, the review of the following two documents is highly recommended in learning defects and deterioration of concrete (Reference 1 and Reference 2). Defect: An identifiable, unwanted condition that was not part of the original intent of design. 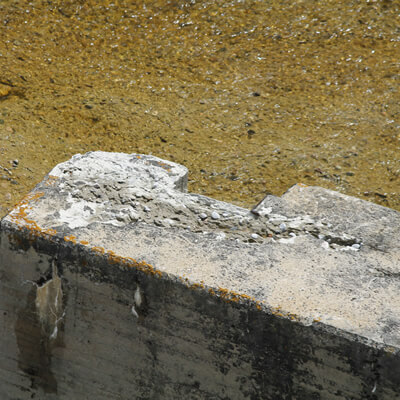 Different defects can be involved in the deterioration of concrete. The following review provides a brief summary on the most common defects observed in the existing structures. Normally, one or a number of these defects can be seen in structures; therefore, it is necessary to identify them properly. One needs to understand these different defects properly in order to get more realistic evaluation of the structure. Scaling is referred to the loss of the surface portion of concrete (or mortar) as a result of the freezing and thawing (OSIM, 2008). It is a physical action that usually leaves the aggregates clearly exposed. (PCA, 2001). Scaling happens when the hydraulic pressure from water freezing within concrete exceeds the tensile strength of concrete. Scaling is more common in non-air-entrained concrete, but can also occur in air-entrained concrete in the fully saturated condition. Disintegration is the physical deterioration (such as scaling) or breaking down of the concrete into small fragments or particles. It usually starts in the form of scaling. It may be also caused by de-icing chemicals, sulphates, chlorides or by frost action. Erosion is the deterioration of concrete surface as a result of particles in moving water scrubbing the surface. When concrete surface is exposed to the water-borne sand and gravel, the surface gets deteriorated by particles scrubbing against the surfaces. Flowing ice particles can also cause the problem. It is an indicator of poor durability of concrete for that specific exposure. Corrosion is the deterioration of steel reinforcement in concrete. Corrosion can be induced by chloride or carbonation. The corrosion can result in cracking in the concrete cover, delamination in concrete decks, etc. When the concentration of chloride ions above the surface of reinforcement reaches the threshold limit (which is the amount required to break down the passive film) corrosion begins. The volume of resulting material (rust) is 6-7 times, which increases the stress around the rebar, and causes fracture and cracking. The cracks extend to the surface of concrete over time; that is when we can visually see the sign of rust over the surface of concrete. “Delamination is defined as a discontinuity of the surface concrete which is substantially separated but not completely detached from concrete below or above it.” (OSIM, 2008). Delamination is often identified by the hollow sound by tapping or chain dragging of concrete surface. The corrosion of reinforcement and subsequent cracking of the cover can cause delamination. When the rebar have small spacing, the cracking extends in the plane of the reinforcement parallel to the exterior surface of the concrete. Spalling can be considered an extended delamination. 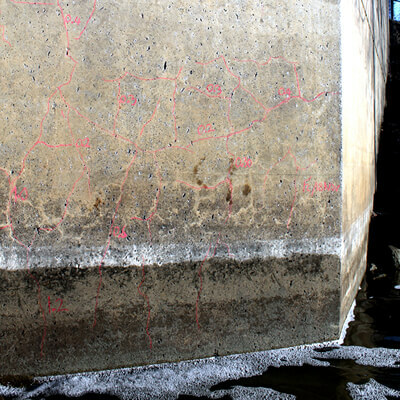 In fact, when the delamination continues, the concrete fragments detach from a larger concrete mass. If delamination is not repaired on time, the progress of damages as a result of external loads, corrosion, and freezing and thawing can break off the delaminated pieces. It is the internal cracking of concrete mass as a result of a chemical reaction between alkalis in the cement and silica in the aggregates. The AAR/ASR cracking are very famous for their crack patterns. The alkalis in the cement can react with the active silica in the aggregates to form a swelling gel. When this gel absorbs water, it expands, and applies pressure to surrounding environment which makes the concrete crack. A crack is a linear fracture in concrete which extends partly or completely through the member. 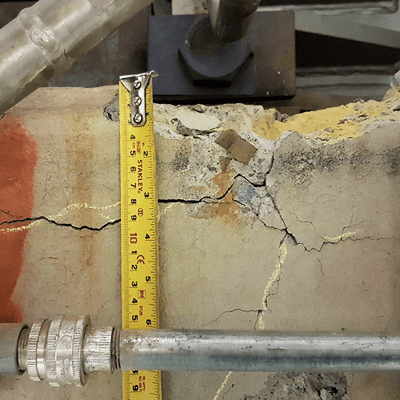 This entry was posted in Inspection and Evaluation and tagged Concrete Testing, Corrosion, cracking. Bookmark the permalink. ← How to Test Damaged Bridges? Hydraulic concrete structures in water subjected to fluid velocity > 3.2 m/s need special mix design & additional coatings to prevent surface cement loss. Also rapid hardening cement if used without guideline may causes concrete cracking due to internal chemical reactions of components. Best use normal Portland cement for concrete. The concrete can also be designed to be resistant by using very durable concretes, such as high Silica Fume content concretes. Refer to the US bureau of Reclamation work on spillways for further information. It is a good informative article on the fundamentals and, after the incident has taken place. May be adding, how and what to regularly inspect and record, along with instant maintenance techniques if added, make it practical in the field. Good technical information. It would be worthwhile to evaluate that what type of deterioration is considered to be a major structural damage ? Spalling, specially in case of slender columns ? Cracks wide enough to expose steel bars ? Etc. Also important is the alignment(vertical, horizontal or diagonal) and location of cracks in load bearing and bending moment resistant members. These will indicate design or workmanship deficiencies other than the reasons mentioned above . Regards . Concrete waterproofing prevents or greatly reduces damage from all these causes. It is often ignored in new construction because the damage is down the road and some ones maintainance budget can cover it but for the facilities owner this is penny wise and pound foolish thinking. Waterproofing at the time of new construction can save many times its cost over time. Basecrete a polymodified concrete is a cost effective solution. Concrete Water proofing may be sufficient for most of the structures but sewer manholes /treatment plants require special coats such as epoxy based painting two to three coats for raw sewer attack on concrete considered as extreme environment. Design life of these structures are less than 20 years. If you get more aggregate on these areas that are deteriorating, it could make the place hold a little bit longer. I think you should really make sure that the aggregates don’t get ruined because you will need them. It might also help to have something to block out water so it doesn’t get worse. How about the remedial measures? Reasons for concrete cracking – need to also include basic/autogeneous shrinkage, and heat of hydration effects during construction. This is very basic information , almost too basic for experienced concrete practitioners. As a concrete petrographer, I have seen all of these and additional deterioration mechanisms. Nevertheless, a good brief introduction to common concrete problems. Good reminder for us practitioners. Hope to hear more from you. If Spalling occurs in roof slab, how to repair it? Very important article for concrete world! Thank you. Very good info. Deformation or cracks in concrete has to be attended on priority otherwise the important structure will collapse. Good info to start discussing concrete repair. We love to hear latest concrete repair approach. Usually the most effective way to prevent most of the problems with concrete is to use aggregates containing the ideal amounts of calcium carbonate and silicates with good freeze- thaw properties to start with. Water content must also be closely monitored. There are so many things that can affect concrete adversely after pouring that it only makes sense to control the factors you have control over during production. All known mechanisms of concrete corrosion & deterioration (and they are 11 mechanisms) have one common denominator, and that is WATER. If Concrete doesn’t absorb water, NON of those mechanisms can happen. The addition of an HPI admixture (Caltite) to the Concrete mix, makes it Hydrophobic, i.e: (water-repellent concrete) preventing the root cause of all deterioration in concrete, resulting in durable & sustainable concrete. Durability of the concrete can be improved by adding fiber. Most economical and easiest to use is polypropylene fiber. Secondly, fly ash can reduce the non durable binder in concrete that make the concrete permeable and susceptible to chloride attack. You should really have included carbonation as a cause in corrosion, as well as just plain old lack of cover! Thank you for explaining what spalling is. My friend mentioned the word in passing, but I couldn’t figure out in what context it was. It definitely made that conversation make more sense and made me feel more informed for what to look out for on various concrete structures.